I promised to write more about Dala-Floda embroidery tradition, TAST week 13, Satin stitch week. But instead of writing myself I will link to some blog posts of interest, by a friend, who has written far better texts than I can do. Embroidery on wool, with loosely spun threads, that makes a soft and textured surface. His name is Lars and he is a talented knitter, who also has a broad interest in traditional textiles. (The picture above is from his blog.) He has just started to learn embroidery. Lars writes in English and has published lots of pictures. You can click on the pictures to enlarge them. Dala-Floda is famous for more than embroideries. Follow the links below, and you will see. (All links are opened in a new window). You can also see the kinship with my ”Flowers of Paradise” print used for my TAST stitching. Do you want to see more? Make a Google search for pictures. I suggest some Swedish words to use, that might give you a good search result. You can easily copy and paste, even if you don’t understand the words: Dala-Floda broderier, Floda broderier, Floda Hemslöjd, Påsöm. There is also a digital museum at http://digitaltmuseum.se. You can try the same words for searching. 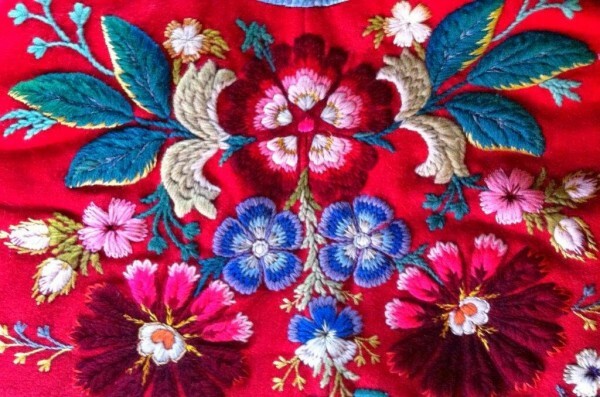 I hope you will find pictures of embroideries from Dala-Floda inspiring. This entry was posted on onsdag, oktober 7th, 2015 at 06:22	and is filed under Allmänt småprat, Broderi, TAST (in English). You can follow any comments to this entry through the RSS 2.0 feed. Both comments and pings are currently closed. thankyou so much for these links I enjoyed reading about this form of embroidery over my morning coffee! This has been the most amazing post and learning experience, thank you for the links to Lars site. His story is wonderful. I’m so glad that this beautiful embroidery and style of knitting will not die out. Thank you Mandy. I will forward your comment to Lars.